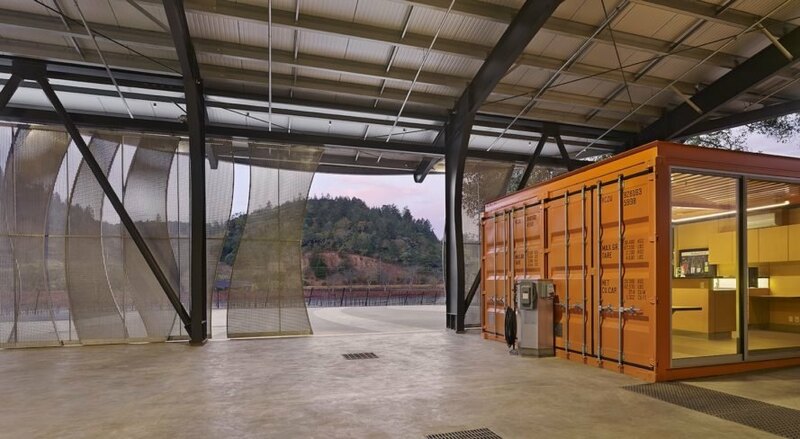 Cargotecture has found an unlikely home at a winery in Napa Valley. 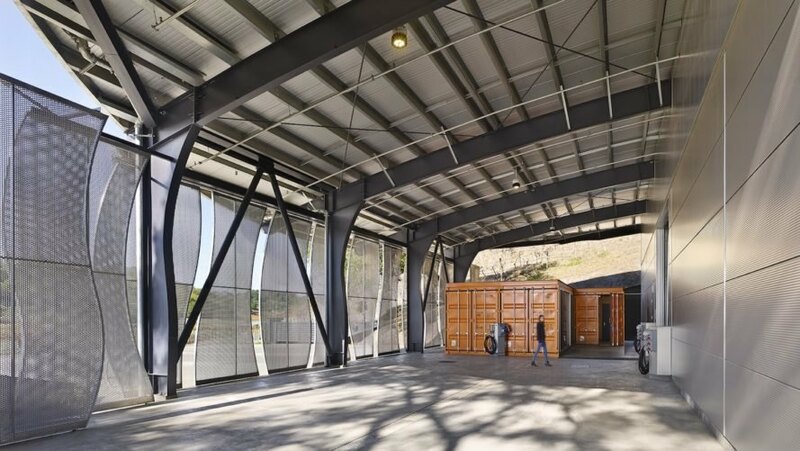 Local firm Signum Architecture completed Odette Estate Winery, a LEED Gold-certified round building powered by solar and fitted with three shipping containers repurposed as offices. Designed to reflect the elegance and femininity of the wines produced there, the winery sports a curved form that evokes a swan’s wing—a nod to the Tchaikovsky ballet character Odette of Swan Lake. 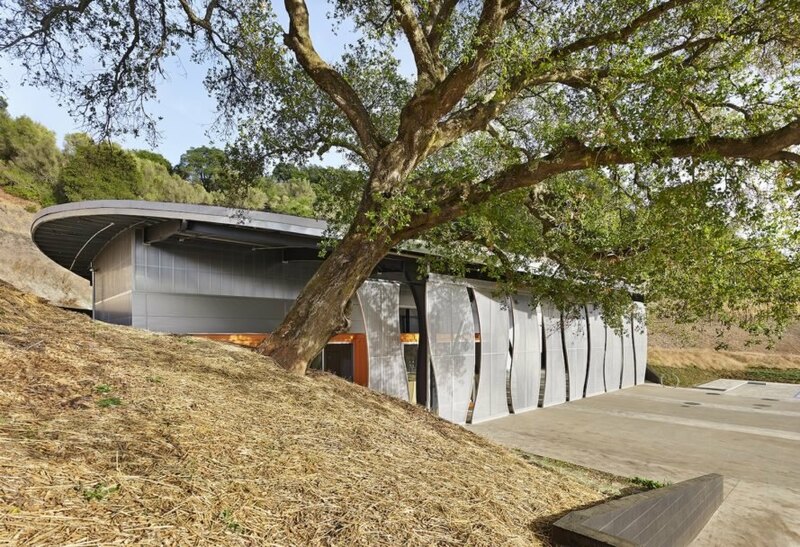 Selected as an Industrial Building Category winner in the American Architecture Prize 2017, the Odette Estate Winery was recognized for its elegant and sustainable design. The building’s adherence to LEED Gold standards is a visual continuation of the owner’s commitment to sustainable farming and wine production. 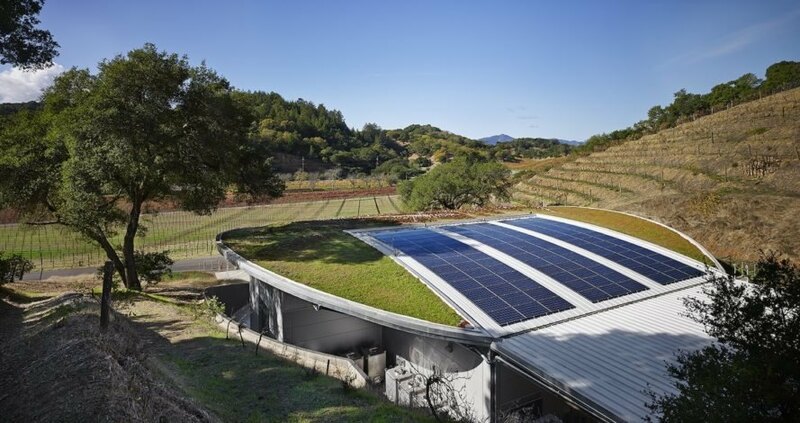 Solar panels provide renewable energy while conscientious use of building materials lower the winery’s carbon footprint. 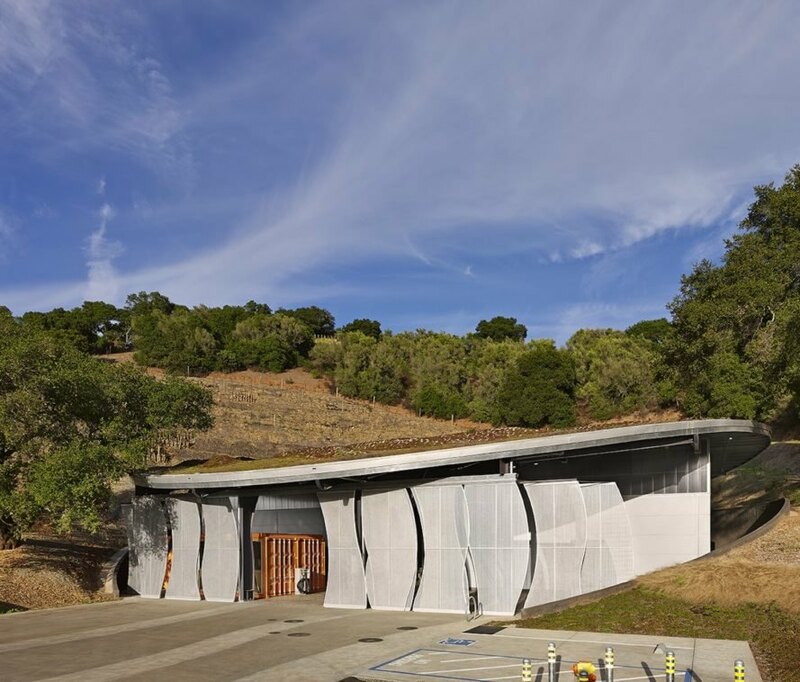 Nestled between the valley’s eastern hills, the Odette Estate Winery is topped with an undulating living roof that replicates the hilly topography. Sliding perforated aluminum screens cut into curving organic shapes shield the winery’s covered crush pad and open-air workspace. The mesh panels allow natural ventilation and light to pass through and, when backlit at night, give the building the appearance of a glowing lantern. The repurposed shipping containers at the front of the building are used for a state-of-the-art wine laboratory and office space. The fermentation and barrel room take up the majority of the building footprint. 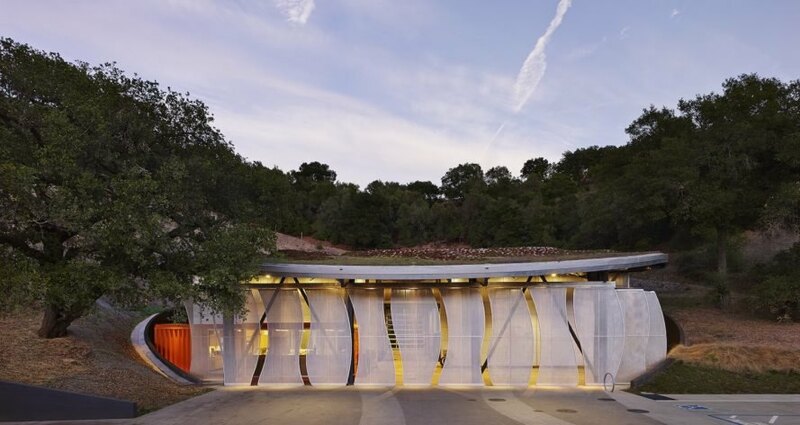 Selected as an Industrial Building Category winner in the American Architecture Prize 2017, the Odette Estate Winery was recognized for its elegant and sustainable design. The building’s adherence to LEED Gold standards is a visual continuation of the owner’s commitment to sustainable farming and wine production. Solar panels provide renewable energy while conscientious use of building materials lower the winery’s carbon footprint. Nestled between the valley’s eastern hills, the Odette Estate Winery is topped with an undulating living roof that replicates the hilly topography. Sliding perforated aluminum screens cut into curving organic shapes shield the winery’s covered crush pad and open-air workspace. The repurposed shipping containers at the front of the building are used for a state-of-the-art wine laboratory and office space. The fermentation and barrel room take up the majority of the building footprint.